Wilson Tucker is known mostly for his science fiction writing. However Tucker did write a few mystery novels, and this is probably the best known of them. Perhaps because it was reprinted by the Detective Book Club in an edition with Victor Canning’s Burden of Proof and Helen Nielsen’s Borrow the Night, it had a wider audience than the paperback printing. Since B. G. Brooks knows he’s alive and well, he’s gone to investigate, but the epitaph isn’t the only reason. Brooks, who goes by the nickname Beejee, is a field agent for The Association of American Memorial Parks, or so his business card says. In reality, he is a government official tasked to investigate “burking”, the practice of diverting bodies from mortuaries to sell them to medical schools and other “customers”; the illegal sale of the dead. Coffins are loaded with sand or graves are left just empty. Brooks is investigating such an operation in the area of rural Illinois where he was raised. A network of mortuaries is funneling bodies to large medical schools in Chicago. The novel has a light tone and Tucker displays a sense of humor, especially when Brooks and the town Marshall’s girlfriend follow clues while at the same time the Marshall tries to keep up with town doings. The residents of Rocky Knoll haven’t seen such excitement in years, and they don’t want to miss a thing. In their enthusiasm they overrun the local graveyard, clog roads with their cars, overwhelm the newspaper office in hopes of hearing he latest rumor. The poor Marshal is overwhelmed and it makes for some pretty funny scenes. This isn’t a long book at 126 pages in the DBC edition, and was a fast read. I enjoyed it. You might too. This entry was posted in books, Friday Forgotten Book, mystery and tagged mystery fiction, Wilson Tucker. Bookmark the permalink. No matter what the genre, Wilson Tucker is always a good (and sometimes a great) read. Thanks for posting this, Richard. It does sound like fun. I’ve never read any of Tucker’s mysteries. Tucker’s an underrated (and mostly forgotten) writer. Good choice. I wasn’t aware that Tucker wrote in this genre. I have a few of his early SF novels and have enjoyed them. Must keep an eye out for this one. I’ve read Tucker’s SF but none of his mysteries. 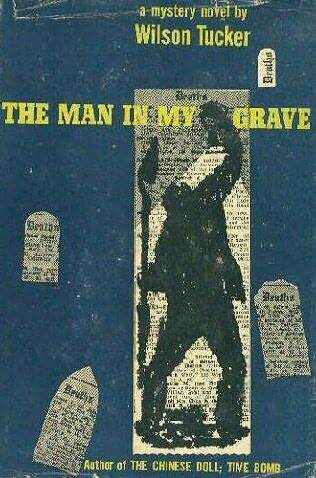 Time to track down a copy of THE MAN IN MY GRAVE. Nice review! Thanks, everyone. The edition I have, the Detective Book Club Edition, is easily available. The paperback, not so much. I haven’t read the other two novels in the book yet, but enjoyed this.